By JoZ1, July 8, 2013 in Plugins - Publishing ONLY! 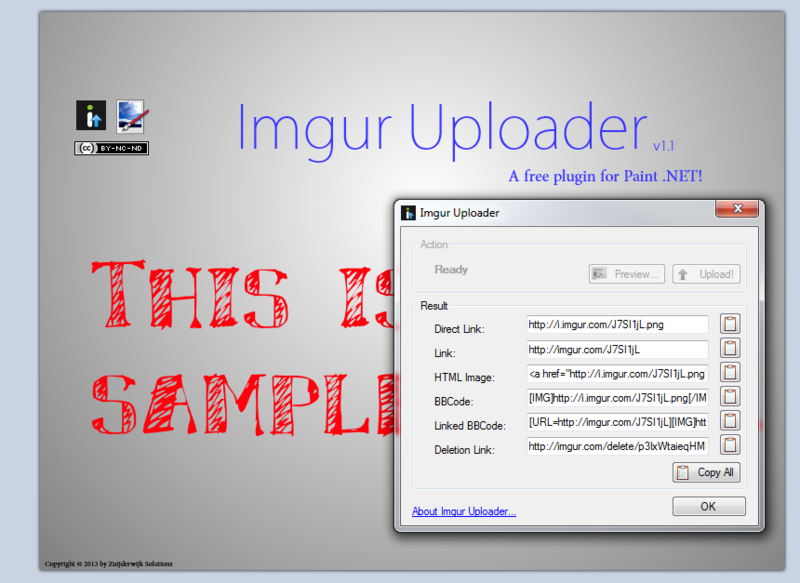 Imgur Uploader is a multithreaded plugin, written in C# (.NET Framework v4.0). It uses the Imgur API v3. The plugin should be placed in the Effects-folder. 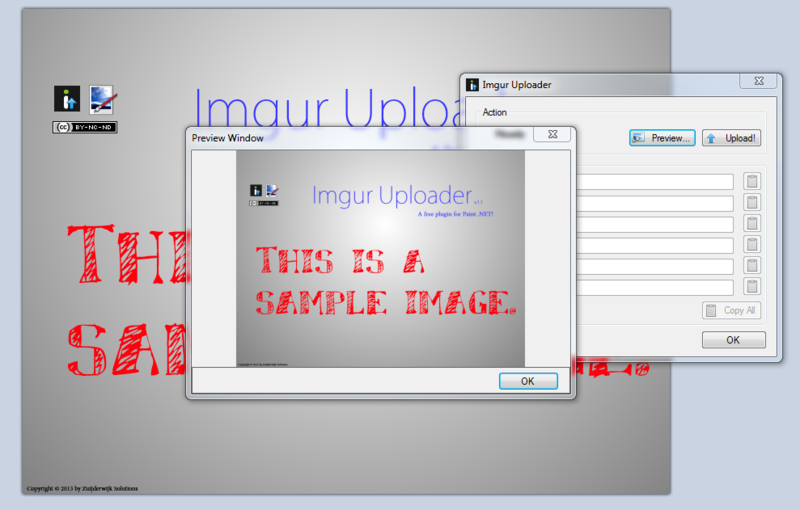 There is no need for an imgur account, the images are uploaded 'anonymously'. 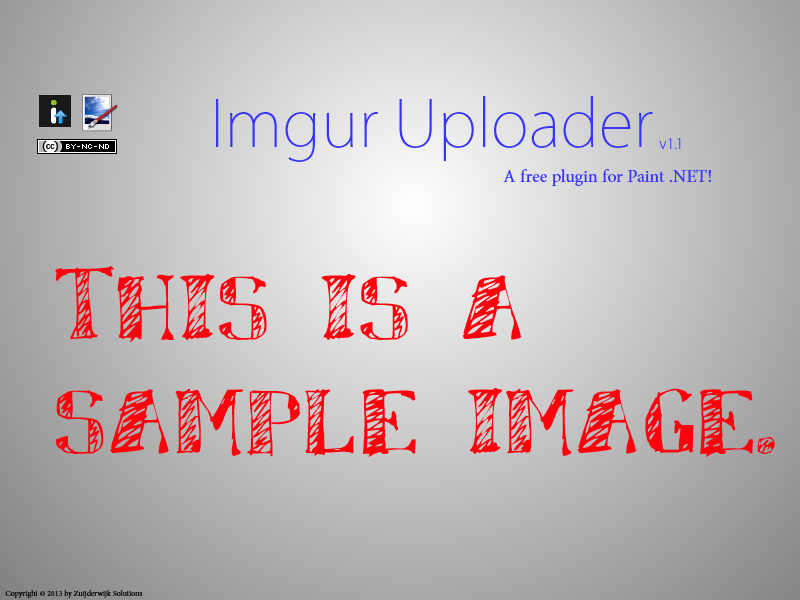 Imgur Uploader only uploads the current layer to imgur.com. I may change that in a future version. UPDATE: Version 1.4, now compatible with PDN v4 ! I don't use Imgur so I'm not sure where you set your account parameters? A description where the plugin should be placed and how to call it. Does it handle the whole image or just the current layer? A short readme in the zip would be nice. Do not misunderstand me but I would need more information to install a plugin from an unknown source. Please replace the OK button with a Close button (hotkey C) and make it close when the Esc key is pressed. That would be very helpful! Great job on the plugin. 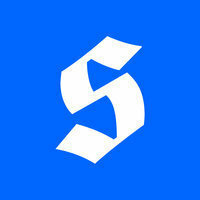 If you were ever thinking of adding the ability to upload to user accounts on imgur then add me as an interested party! Implementing the ability of uploading to user accounts may actually be a good idea, maybe I'll look into that. Unless you subscribe to a thread, you won't get one. In post #9 JoZ1 says they are not recieving email notifications for this thread - perhaps it would be worth private messaging him/her/them?. Why thank you on both accounts I know that sometimes folks leave for a while, but often stop by sometimes - there's always hope. Yup, I'm sorry, I didn't get any mail. I hope I do now by following this topic (again). That was quick! - many thanks. Thanks for the update joZ1. I'll take this plugin off the list of incompatibles later today. It works just fine for me with the recent update. Perhaps you need to try this here. On the screenshot of this plugin, which one of the codes provided by imgr would I need to Copy / Paste so that it's a thumbnail on this forum, but when someone clicks on it, takes them to the full size image ? You should be ok to copy the code in the 'BBcode' box. Then when in the forum editor click on the code switch (top left) and paste. - Then manually change 'IMG' to 'thumb' in the start and end tags of the code. keep the '/'. If not sure, use the forum's 'more reply options' box (lower right) and preview the post. You should have a clickable thumbnail that links back to the full-size image. Cheers for that Red, very helpful indeed. Thank you. I'd very much love the ability to upload to my account. It would help a lot for keeping track of my uploads and I wouldn't need to keep deletion links.